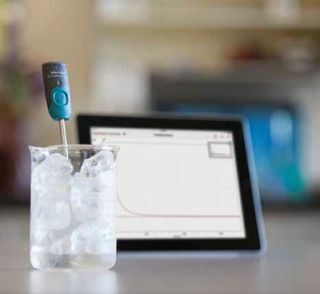 The Vernier Go Wireless Temp is a wireless temperature sensor students can use to remotely monitor temperature using most iPad, iPhone, and iPod devices. Quality and Effectiveness: The Go Wireless Temp can be used for many different projects across grade levels. Students can download the app onto iPad, iPhone, and iPod models that support Bluetooth Smart (Android devices coming later) and conduct real-time experiments in the classroom. Students use the app to watch and record temperature changes during science experiments. They can then send this data to their devices using Numbers, the iPhone spreadsheet app, Vernier’s Graphical Analysis for iPad, iPhone, and iPod, or other third party analysis apps. Ease of Use: The app is easy to use, fast, and requires very little need for support. Charging the device is simple with the rechargeable USB port. The app works seamlessly with the wireless probe; once the app recognizes the probe, it will automatically display the current temperature. Students then select “collect” to record the temperature history. • Measuring the effectiveness of sleeping bags. Suitability for Use in a School Environment: The Go Wireless Temp app and device are wonderful tools to extend a science classroom or math lab. The ability to use the information to compare and contrast different problems, such as recording the time it takes water to reach a boiling point using glass versus steel, allows teachers and students to be creative with their science and math experiments. • Device and app are in sync. • Mobility makes it more engaging. OVERALL RATING: The device and app make the Go Wireless Temp a highly desirable product for teachers looking for new ways to engage students in recording temperature.